Kevin won 1st prize in the 2018 Paganini International Violin Competition! Read about it here. Kevin Zhu appeared on Show 301, recorded in San Francisco, CA, on February 14, 2015; and Show 264, recorded in Sarasota, FL, on December 11, 2012. Kevin Zhu (violin), 14, is from Cupertino, California. Kevin is currently a scholarship student in the San Francisco Conservatory of Music preparatory division under world-renowned violin pedagogue Li Lin. 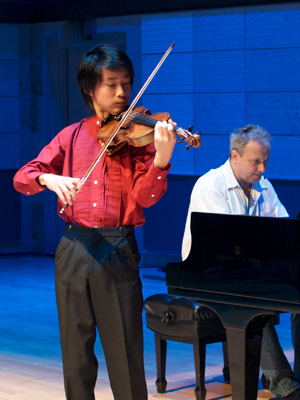 He also participated in the Perlman Summer Music Program headed by Itzhak Perlman in 2013. He has performed as a soloist at prestigious venues such as London’s Royal Festival Hall and China’s National Centre for the Performing Arts. In the 2012 Yehudi Menuhin International Competition for Young Violinists in Beijing, Kevin won first prize in the Junior Division, becoming the youngest-ever winner in the 29-year history of the competition. He also took home the Composers Prize for the best performance of a new Chinese work. Kevin previously appeared on From the Top in 2012, on Show 264, taped in Sarasota, Florida. As a Culture Ambassador of the Lin Yao Ji Music Foundation of China, Kevin was a featured soloist at Harpa International Music Academy in Iceland in the summer of 2013. He was also invited to perform Tchaikovsky Violin Concerto with Symphony Parnassus at Nourse Theatre in San Francisco in November 2013. Kevin Zhu (violin), 12, is from Cupertino, California. Kevin studies under Li Lin at the San Francisco Conservatory of Music. He was the youngest competitor ever at the 2007 Menuhin Competition in China, where he won first place in the junior division. Kevin also performed at the Music@Menlo Music Festival in 2011, and is an active participant in his schoolÕs choir at Lawson Middle School. Aside from playing the violin, KevinÕs other interests include astronomy and playing basketball.